If you read my posts on Serious Eats: NY you may remember that I reviewed the take-out Turkish restaurant Bi Lokma. Bi Lokma is run by Orhan Yegen, the outspoken Turkish chef who makes no bones about calling his food the best Turkish food in new York. I met up at Sip Sak, Yegen’s sit-down restaurant, with my friends Robyn, Melissa, and Max for dinner the other night — Max, who has spent lots of time in Turkey, thinks it lives up to its reputation. 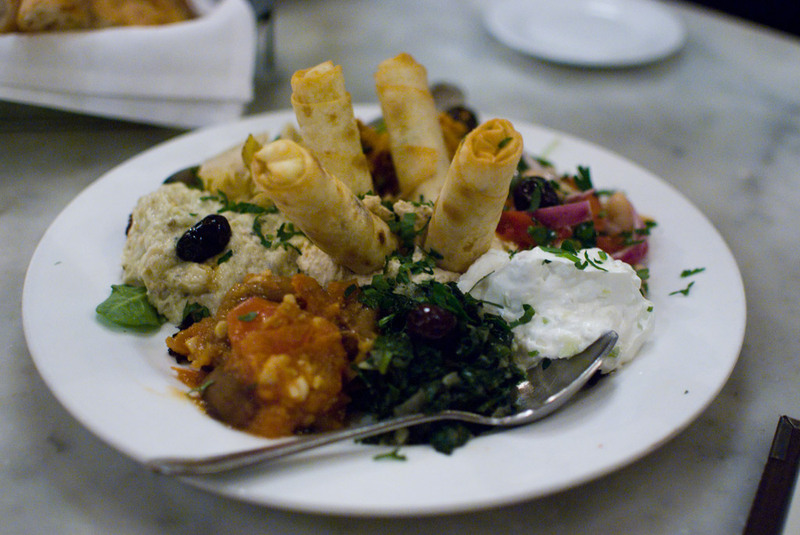 We shared a salad plate, which was the highlight of the meal for me: smoked eggplant salad, fried eggplant with tomato, yogurt with cucumbers, spinach salad, olives, cheese wrapped in filo, and the most interesting tabbouleh I’ve ever tasted (I think the bulgur was toasted; it was almost crispy). The vegetable platter was a rehash of the food I’d eaten before, and not nearly as exciting. Yegen himself came out several times to the dining room to charm his guests, though reportedly he can be a terror if you say the wrong thing to him. Better to keep your head down, eat your food, and enjoy it.